1. Gmail attachment. I have sent an e-mail with attachment to eagleget.test@gmail.com. Please login with password e-mailed to you. 3. logfile has been sent to eagleget.test@gmail.com as well. Thank you jackuars and eastern. hi, I downloaded eagleget today. Tried it out on how to use eagleget videos on YouTube. Click on the sniffer button, nothing happened. No folder opened. Click on the progress button, for downloads in the queue (3 the same video), 0 bytes downloaded, 0B/S. I have a screenshot but can't see how to upload it on this site. You can use ShareX application for taking screenshots and uploading to imgur then posting imgur URL in the forum. Its easy to use and have great features. Thanks for the advice Max, I use Greenshot to take screenshots, and I don't really want to download software to send screenshots from my PC to unknown URLs... I'm sure everyone knows the progress window anyway. Perhaps we could bypass the screenshot and get to solving the issue of the 0B/S non-downloads? It did just download one video. 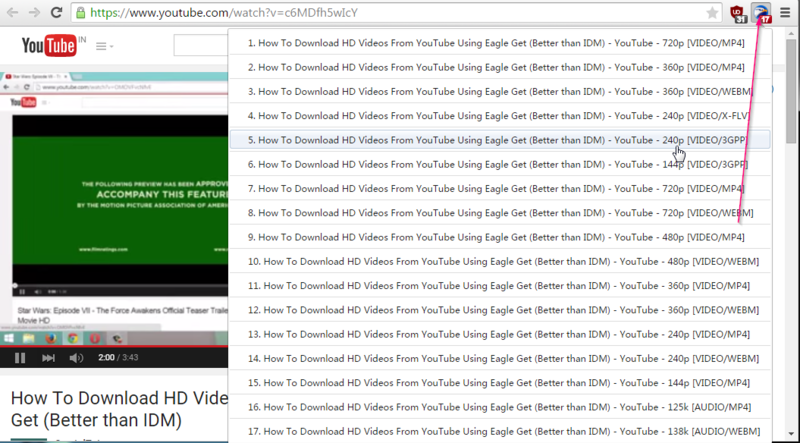 Unfortunately the downloaded video was 2.7 kb, not the 2 minute video which I downloaded Eagleget to capture! Don't know how to open the log for it? Well, ShareX is lightweight, open source and safe program without any adware, malware, spyware and works on multiple sites not only imgur. It also has greenshot editor(not sure if other parts are based on greenshot as well). But as you wish. You can directly upload screenshots to imgur.com or postimage.com in the future without any software and no need to make account. They are safe sites. I don't think by log you meant like in the above screenshot jackuars posted. Can you explain more? Hopefully this problem is fixed soon. The video sniffer doesn't work with Youtube, but it works on most other sites. For Youtube you can directly use the extension on your browser to download videos like in the figure below, which when clicked shows you various formats that you may download in. Or you can also use the Media Grabber, from the main interface, and paste in the URL manually. If you have paused the video and resumed after longer periods of time, then you may need to refresh the link to resume the video download. Simply right click on the task in EagleGet's interface and click on Refresh link. thanks for your feedback, we have confirmed this issue, you could use the media grabber to download this site video. I recommend using http://snag.gy/ since it makes a link of the copied image just by pasting it. 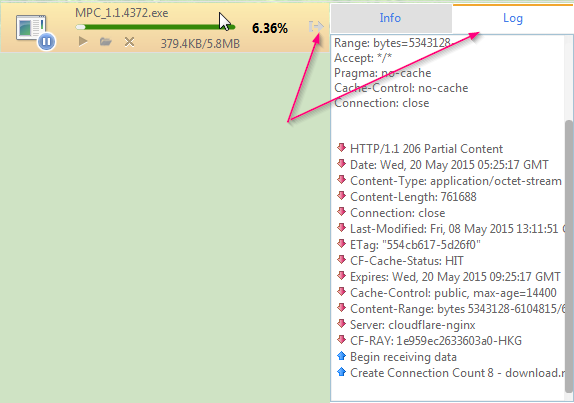 Its not able to download http://37.59.158.254/getlink/rapidgator … 853324.rar. It just shows that nothing has been downloaded and that it "Can't Resume". the link has expired. could you post the URL again? I have been using EG for past 15 days. One problem is occurring every now and then. I keep max 5 downloads simultaneously (MP3 files). Many times the downloading halts (the speed drops down to 0 KB/s). In such case, I right click to 'pause all' and then again 'start all', after which the downloading resumes for a few minutes and again the same problem repeats. Any workaround for this? Topic moved here. As eastern mentioned, do give the links for testing. so, as you told me to do, here is my problem: speed always drop'in down to 0b/s, but it continuous, I mean, I am download for example, 150KB/s than goes to 0, after 3/4 seconds goes up to 50, 0 again, 120, 0, and it continuous with the "loop". I cant show you more than the log file, becouse it heppens with all websites I visit, bitshare, uptobox, uploaded, mega.nz, even youtube... it does not stops in a precise percentage, it just goes 120KB>0>120 all the time till the archive is downloaded, the pauses can last a second or several seconds. For me I uninstalled EagleGet from my pc, pretty annoying with 0KB/S. I liked it very much in the beginning. I'll switch to another download manager. Like FDM or IDM. I'll be back to EagleGet when it is properly functioning. I download something always.. half of my downloads are stops at %99 or %99,9 ... Why? I have to stop and start the download again but sometimes most of the downloads do not support resume downloading and all these staff was mess.. Please fix this. I removed EG and installed IDM trial. Get Zemana AntiMalware FREE! to clean your infected PC! When the download link expires, the downloads might stop so you will have to right click on the Task and select Refresh Download Address which takes you to the webpage to resume the download.